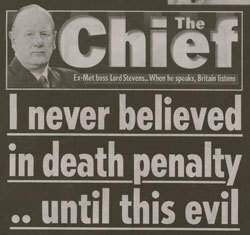 Lord Stevens - former Metropolitan Police Commissioner - has used his column in the News of the World (not online) to call for police murderers to face the death penalty. His intervention comes after Friday's killing of a Bradford WPC. "For the first time in my life, despite 40 years at the sharp end of policing, I finally see no alternative. Such an extreme act of pure evil can only be met by the most extreme of responses - and that can only be death." He says that the growing inadequacy of sentences has fuelled his change of heart. Life no longer means life, he complains, and that imprisonment is an inadequate disincentive "to the creatures who inhabit the deepest depths of our society today". "There must be massive safeguards to ensure the wrong people don't go to the gallows. But those who can incontrovertibly be proved to have murdered a police officer should be killed... I now know that capital punishment is the only major way left for the majority of right-thinking people to fight against the minority of monsters in our midst." "A police officer is someone you and I have chosen to defend and uphold the very basics of our society, our state. We appoint them guardians of what we have decided is right and wrong." As awful as this and other cases are I am firmly of the view that the only time it is acceptable to take a life is if a life is under direct threat if you don't. The United States is, I believe, the only western democracy with the death penalty and the EU (much maligned as it is on these pages) has a strong anti-death penalty ethic, which I am pleased to see. I'm not sure that the immediate aftermath of this apalling act is the right time to make policy either about the death penalty or indeed arming the police. Calmer and more rational times will come. For the moment perhaps we should just mourn the passing of a decent and courageous human being, whose loss will be felt most keenly by her children, and put all our energies into finding her killers. I simply can't agree with Lord Stevens on some of the issues he has raised. Whilst he is right to bemoan the long-established decline in effective custodial sentencing, his volte-face on capital punishment for the murder of a police officer is simply not credible. The murder of this young W.P.C is of course a tragedy for her husband, children, and West Yorkshire Police, but Lord Stevens has to understand that the Police are no longer viewed by the vast majority of people in this country as being any different from anyone else. The Police are no longer held in the same esteem by the law-abiding citizen as they once were. Of course this has unfair consequences on the men and women on the frontline, for not only are they having to face ever-increasing danger on Britain's streets, they have - through the ideological dogma of their Chief Constables and the Home Office - lost the confidence of the British public. This has been one of the most grotesque effects of New Labour's time in office and will take a long time to correct. So, if capital punishment was to be the answer (and I doubt this), then every murder victim must be accorded the same level of justice. The use of violence by the State to punish wrong-doers is a thing of the past and should have no place in a modern democratic society, and as Kate Castle states above it is an issue far too complex for organs such as the News of the World and its simplistic prescriptions. The European Union welcomes the entry into force on 1 July 2003 of Protocol No. 13 to the European Convention on Human Rights, concerning the abolition of the death penalty in all circumstances. This Protocol is banning the death penalty in all circumstances, including for crimes committed in times of war and imminent threat of war. No derogation or reservation will be allowed to Protocol No. 13 to the European Convention on Human Rights. As of today, 41 out of the 45 Member States of the Council of Europe have signed the Protocol, which was opened for signature by member states of the Council of Europe only a little over a year ago, in Vilnius, on 3 May 2002. I disagree with Lord Stevens' comments that "police killing is different from other killing".It isn't, especially to the victims families. Derek Johnson is right when he says that "every murder victim must be accorded the same level of justice". Kit Malthouse is so right. Disagree completely ! The whole basis of the polity is that it has a monopoly on violence, or the polity will disaggregate and private enforcement will develop as the "State" ceases to be relevant in law and order matters in areas of the nation. I'd be interested to see somebody argue why it is morally unjustifiable to execute a convicted murderer, but morally justifiable to kill innocent people when bombing a city. but morally justifiable to kill innocent people when bombing a city. The muddle-headed liberal attitude to state-sanctioned violence should be challenged by Conservatives, whose philosophy gives them a much deeper understanding of human nature. We abolished the death penalty - the murder rate has gone up relentlessly. We abolished the birch - our street are now far less safe to walk on. We abolished corporal punishment in schools - and now suffer an epidemic of school bullying and assaults (even on teachers). A paradox? Of course not. Those tempted by wrong-doing no longer fear authority because authority has been emasculated by the utopian, self-destructive doctrines of liberalism. As an advocate of the death penalty the one thing I can't stand is publicity hungry idiots jumping on the death penalty bandwagon after a terrorist attack or a high profile killing. These people don't seem to understand that murder is murder and that if they want to call for the death penalty they need to make a sustained and intelectual case for it's return instead of making foolish knee jerk reactions. I have always been a supporter of the death penalty! I served 27 years in the Army followed by 10 years in the Metroploitan Police and when I retired, I went into politics immediately but I am now very disturbed at the state of this country. If we had 'banned the bomb' as called for by these left wing liberal idiots then we would have had a major European war long ago, that we did not was as a result of a workable deterent. Crime has exploded for the lack of the same, we have no deterent. The people in the street are about 80% in favour of the death penalty but our elected representatives use their so called conscience to get rid of it so just who do they represent? Thankfully, killing of police officers is still pretty rare in this country. Whilst always a terrible thing, it is not a uniquely horrible crime. Fred West, Harold Shipman, Ian Huntley... these men all committed crimes that were "pure evil". I cannot see why Lord Stevens seeks to distinguish between the police and other victims. Whilst I would still disagree with his support for the death penalty, it would have much more consistency if he called for it to be applied across the board. If we were to bring back the death penalty, why confine it to just "police-killing"? Why not the Ian Huntley's and other violent criminals of this country?